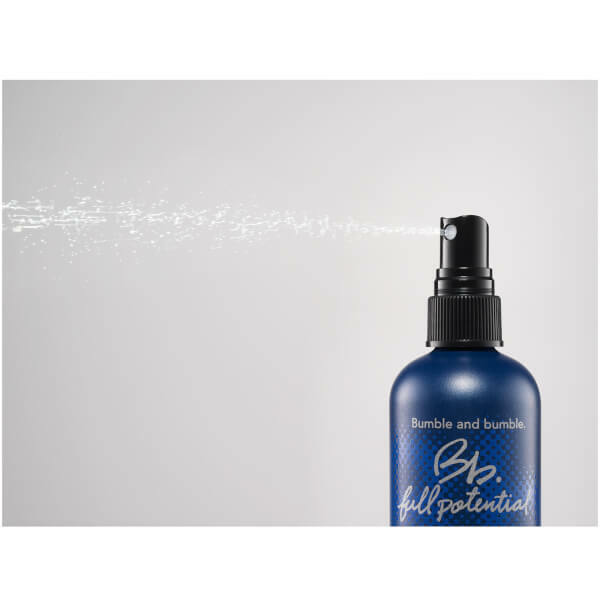 Bumble and bumble Full Potential Booster Spray is a non-greasy, restorative spray developed to transform fine, thinning hair and prevent hair loss. Dedicated to promoting a healthy scalp and invigorating the hair, the spritz boosts elasticity and strengthens strands from root to tip. Fortified with the brand's Hair Preserve Blend™ and UV absorbers, its unique formula acts as a 'liquid bandage' to minimise breakage and hair loss caused by over-processing, colour-treating and environmental or heat damage. 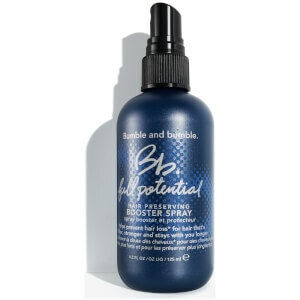 Suitable for men and women, you can expect fuller, thicker and repaired hair. E.N. Water/Aqua/Eau, Glycerin, Cetyl Alcohol, Petrolatum, Cetearyl Alcohol, Isopropyl Myristate, Ceteareth-20, Dimethicone, Phenyl Trimethicone, PVP, Squalane, Beeswax\Cera Alba\Cire D'Abeille, Microcrystalline Wax/Cera Microcristallina\Cire Microcristalline, Bertholletia Excelsa (Brazil Nut) Seed Oil, Orbignya Oleifera (Babassu) Seed Oil, Pentaclethra Macroloba Seed Oil, Theobroma Grandiflorum Seed Butter, Pantethine, Urea, PEG-8 Dimethicone, Sodium PCA, Cetrimonium Chloride, Panthenol, Polyquaternium-7, Polyacrylate Crosspolymer-7, Polyquaternium-51, Trehalose, Myristalkonium Chloride, Quaternium-14, Phytantriol, Panthenyl Ethyl Ether, Sodium Hyaluronate, Butyl Methoxydibenzoylmethane, Ethylhexyl Salicylate, Ethylhexyl Methoxycinnamate, Fragrance (Parfum), Linalool, Citral, Limonene, Geraniol, Butylphenyl Methylpropional, Chlorphenesin, Potassium Sorbate, Sodium Benzoate, Phenoxyethanol.